Arrival at Katni Railway Station by 12412 Gondwana Express at 05:15 hrs. Morning tea at railway station. Cabs to transport participants to Salvan Resorts, situated close to the Magdhi gate of Bandhavgarh National Park, on the two hour drive from the railway station. After check in, participants can dig into the sumptuous breakfast spread, after which there will be time for some rest. Selection of safari routes in premium Tala and Magdi zones would be done by the Jungle Nomads team on the basis of tiger movements and sighting reports closer to the dates of the workshop. With an early morning wake-up call, a cup of tea and cookies, the participants will be all set for yet another exciting day in Bandhavgarh: Starting with an early morning jeep safari in the park, tracking tigers, birding and shooting exciting wildlife moments with your camera. Roaming for an hour and a half in the jungle heartland, the jeeps reach Center Point, where tea and snacks are available against cash payment. Breakfast will be served at the resort upon return. After which, there's time again for interacting with our trainer and other participants. This session may well extend till lunch hour at 13:30, after which we have another safari lined up for the lovers of the wild. Coming back around sunset to our home in the wilderness, the Salvan, where tea will be served and cookies, followed by a whole evening to yourself, to share the experiences with fellows participants. Photography experts at Jungle Nomads will review the participants' photographs and offer guidance every evening. No Monday morning blues on this one! 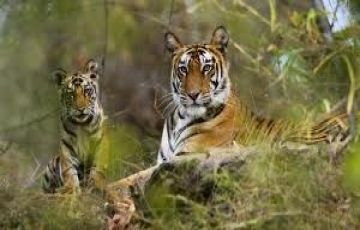 Quite at home in Bandhavgarh by now, and used to starting early, the participants will be escorted to another safari through another chosen routeand following the tiger trails, clicking on the move. and as the sun climbs up on the tree-tops, the jeeps take a u-turn for a leisurely breakfast at the resort. After breakfast it's time again for yet another session of sharing; sharing the camera contents with the trainer and other participants. As usual, this session sees us all to the time when the lunch buffet is laid out, only to be relished in a hurry, before departing for afternoon safari of the day. Another sojourn in the tiger country means another opportunity to watch numerous birds and animal species populating the domain of the big cat, until the sun retreats to the west. Coming back from the dirt roads of the park, it's time to cool your heels in your room at the resort. Closing the day with the dinner, you're left with hardly any energy for anything else other than planning for an early start next morning. Three days old in the wild; by now you must have learned how to spot tigers in the grass that offers camouflage to the big cat, or spotting a Brown Fish Owl resting tree fork of similar hue. Now is the time to take advantage of your experience and aim for more remarkable clicks for your wildlife folders. Start the day with a safari at dawn, the last one on this trip, with the hope and a prayer, that more of the denizens of the jungle come your way. Interspersed with moments of respite as scheduled hours for breakfast and lunch, make this day a more fruitful and memorable one. Once back at the resort after the safari, it's time for breakfast and the daily session with our trainer. As the sun goes higher, you can avail the free time to explore the sylvan surroundings of the resort, before packing up for the journey home. After a leisurely lunch, the whole group will take the cabs to Katni Railway Station to board 12411 Gondwana Express at 17:20, for journey back home.